Have you ever heard of the Isle of Skye? No? Then it’s about time you make yourself familiar with this spectacular island in the north-west of Scotland. I recently had the chance to spend a full week there and had the most amazing weather (read my detailed itinerary here). In fact, I even managed to get a sunburn, despite everyone telling me to bring a lot of rain gear (which I never needed at all; here is a detailed packing list nevertheless). I really have to confess that I fell in love with the Isle of Skye in a matter of hours. Everything left me speechless – and that is coming from a guy who’s been traveling for 30 years, and “seen it all”. 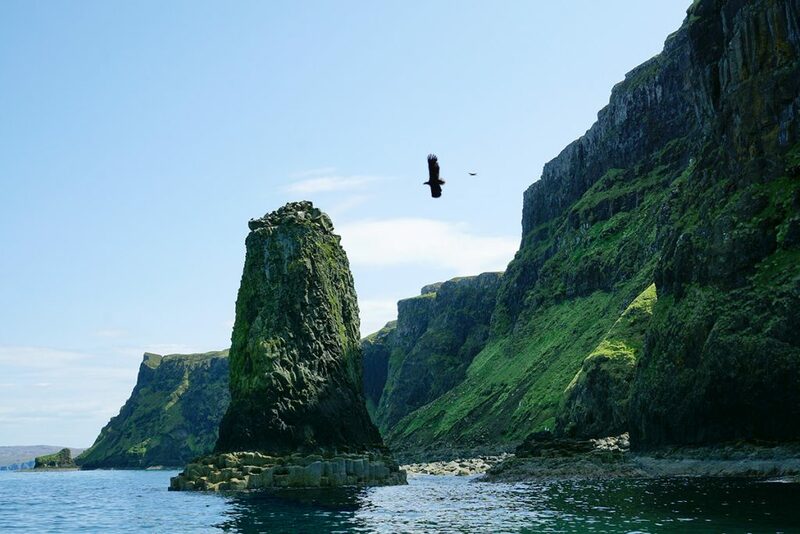 I had the most amazing wildlife experiences, went on breath-taking hikes, enjoyed excellent food and was constantly surrounded by the otherworldly beauty of the Scottish landscape. To give you an idea what to expect (or maybe you are already planning a trip) I’ll share the 10 most amazing things to do on the Isle of Skye with you. Also, have two bonus recommendations at the end, but let’s get right into it. 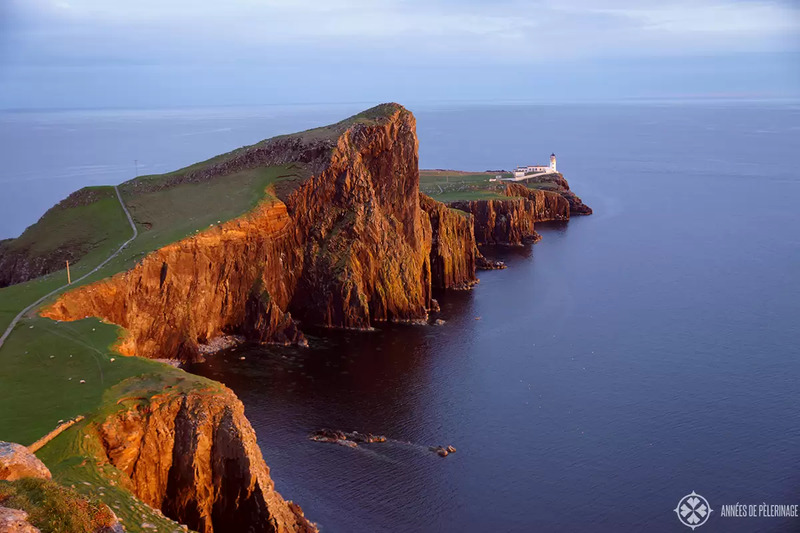 One of the most extraordinary spots on the Isle of Skye is certainly the Neist Point and its picture-perfect lighthouse. 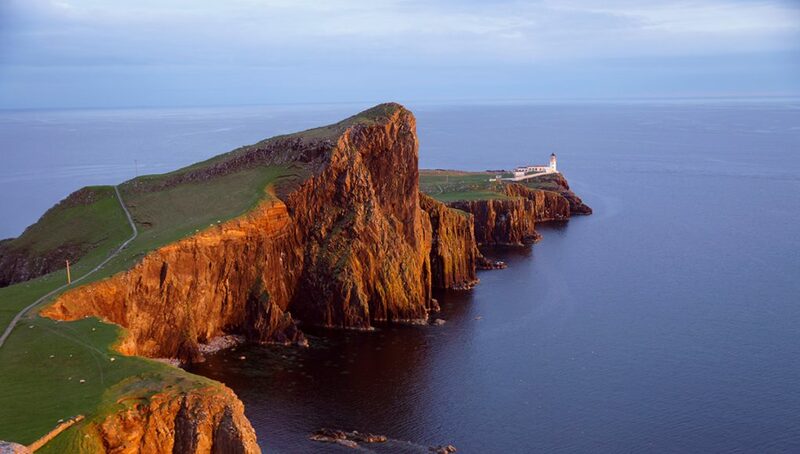 The Neist Point is the most western point on the Isle of Skye, and thus a perfect spot to watch the sunset. 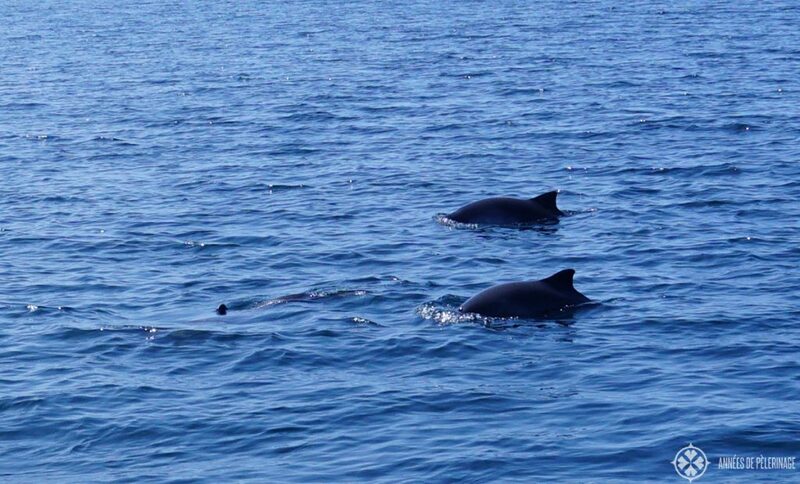 In summer, you will even get the chance to see passing whales and basking sharks. The path to the lighthouse is a bit steep (as are the cliffs), but do not let that discourage you. The daring beauty of the lighthouse will take your breath away! If there was only room for one item on your list of things to do on the Isle of Skye, this would be it! Here is my full guide to visiting Neist Point. Landscape wise it is hard to find a spot on the Isle of Skye that is not outstandingly beautiful. Yet, there are some places outshining the others (if that is possible at all). 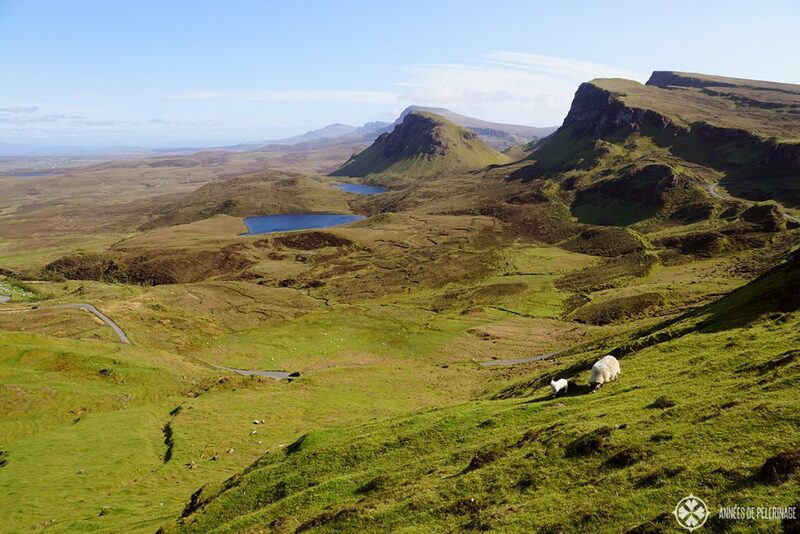 The Quiraing is one of these places. 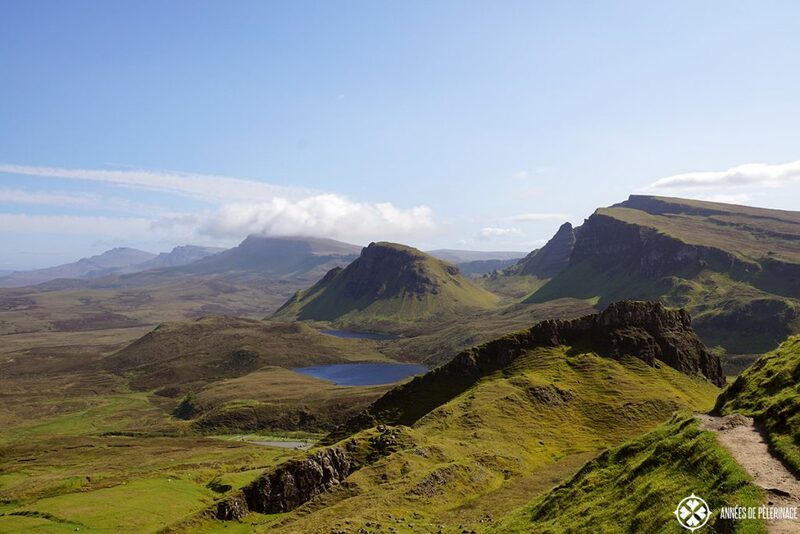 Part of the so-called Trotternish ridge, it feels like god created one big playground for passionate landscape photographers and outdoor lovers. Walking along the moss and grass covered plateau feels a bit like walking into paradise. You will catch yourself taking pictures every three seconds! Best time to visit is the early morning or the late afternoon, though sunsets will be very late in the high season (around 9ish to 10ish). The standard circuit takes about 2 hours to walk. Sometimes nature seems to have played tricks on men. The Old Man of Storr is such a place. A single rock needle almost 40 meters high stands prominently below a huge mountain plateau. Having seen it for the first time, I did not believe it to be real. To me, it looked like the remains of an old castle or so. 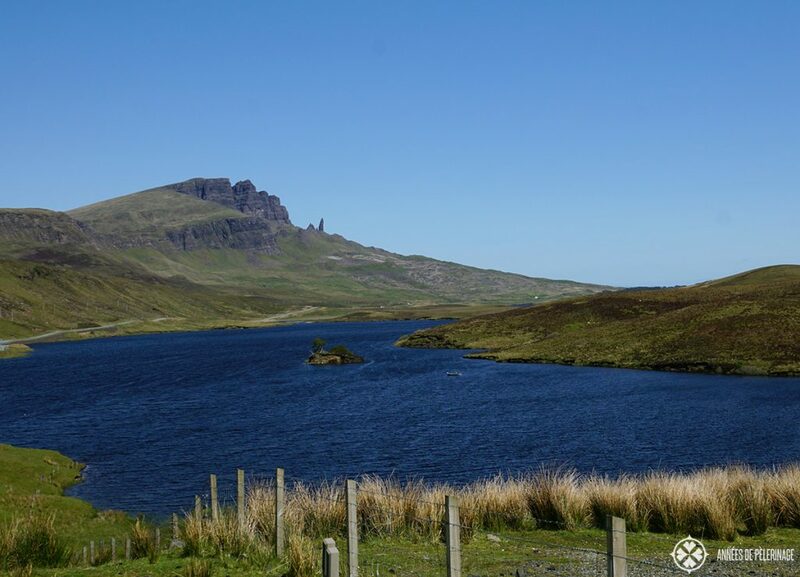 But the Old Man of Storr is pretty much a reality, if a beautiful one. A very well maintained path leads right to the base of the amazing rock formation – taking you on a tour lasting about an hour and a half. Do go! Kilt Rock is another amazing rock formation on the Isle of Skye. 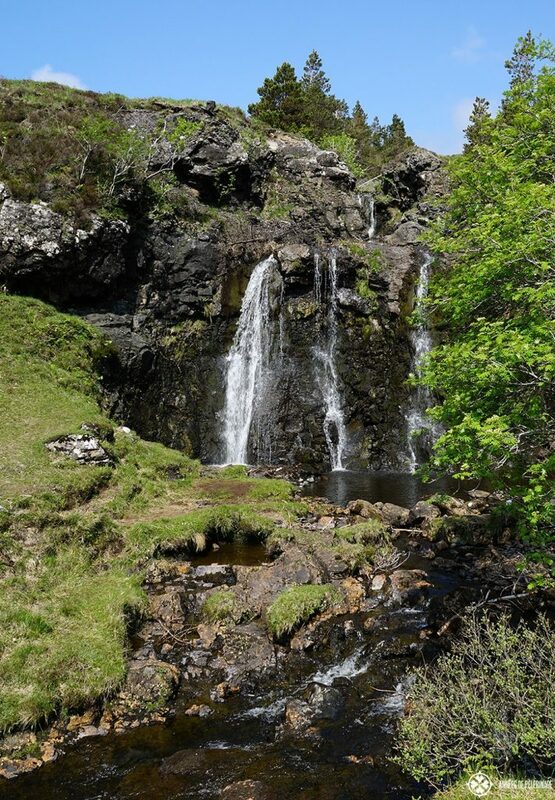 Said to look a bit like a kilt, a fascinating part is certainly the waterfall crashing right into the ocean. Dinosaur footprints have been found right at its bottom, making it an even more fascinating place to visit. 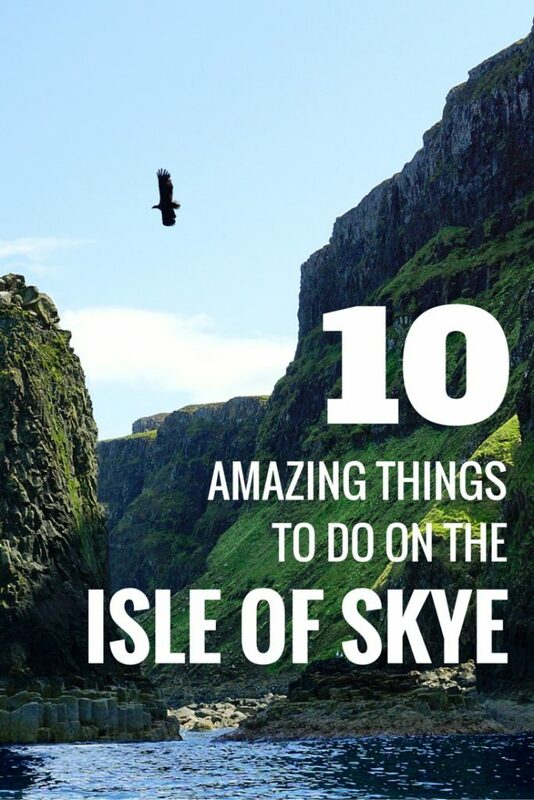 Definitely, put it on your list of things to do on the Isle of Syke! 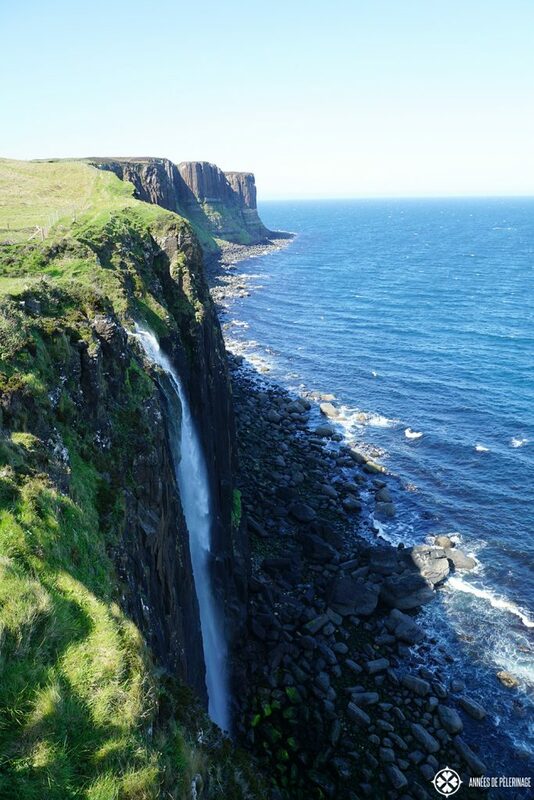 There is a beautiful viewing platform (easily accessible after a short walk of 5 minutes from the parking lot) where you will see the whole bay, wonderful cliffs and of course the Mealt Falls and Kilt Rock. What would Scotland be without its Whiskey? Not a question I like to answer. 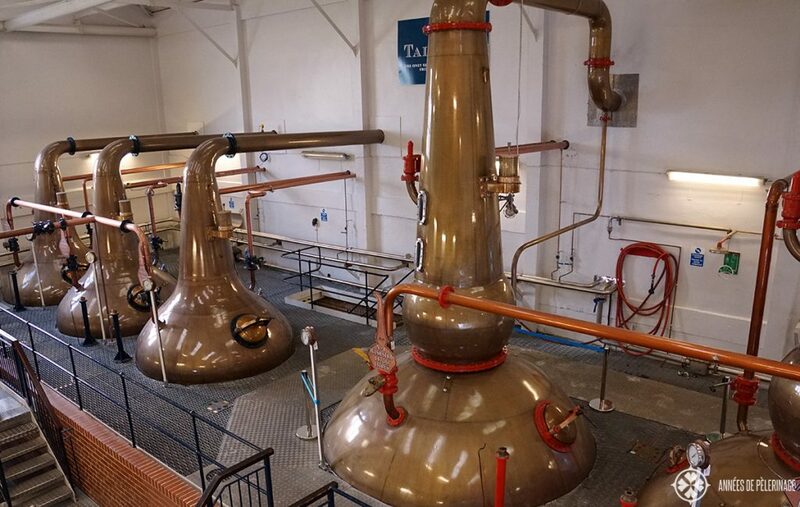 If you ever wondered how the rich drink was produced, then you should definitely visit a distillery. 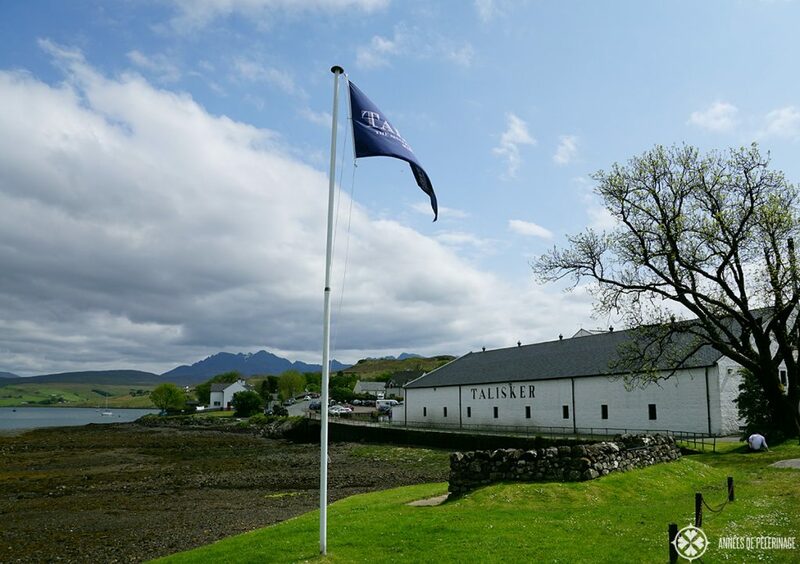 The Isle of Sky is home to one such distillery. It is called Talisker and the whiskey is actually quite famous. Very smoky and produced with the local clear mountain water, it is one of my personal favorites. The tour is somewhat shortish (because parts of the production is done elsewhere), but you will get to see the huge copper kettles used to distill the golden fluid (strictly speaking not golden at this point of the process at all, as you will find out). 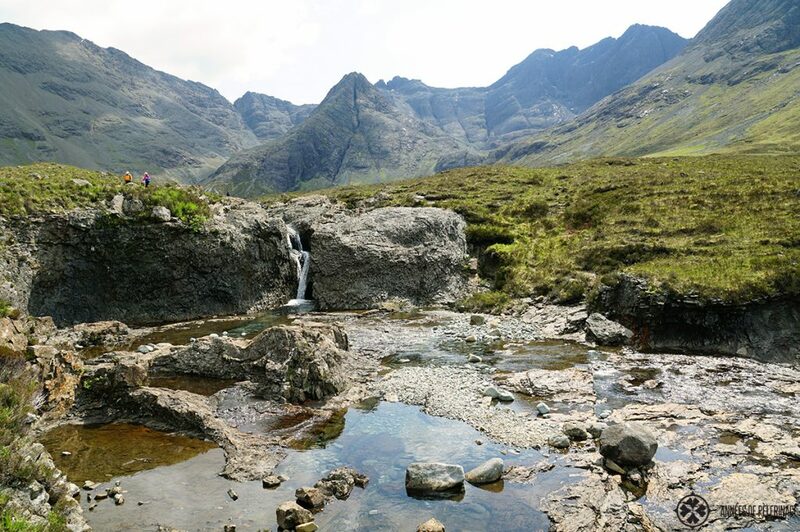 The Cuillin mountain range is one of the highest in Scotland and more than impressive. Usually snow covered until the end of May, there is a path leading all the way up. Now even if you are not a professional hiker (for it surely is a challenging hike), there is still a reason to go. Right at the very base of the impressive mountain ridge, you will find a series of outstandingly beautiful pools, called Fairy Pools. Eons of melt-water running down the steep mountain created a cascade of waterfalls and pools, almost a kilometer in length. In July and August people sometimes can be seen bathing here, though the water will be still very cold. Either way, the scenery will be its own reward for hiking in this area. 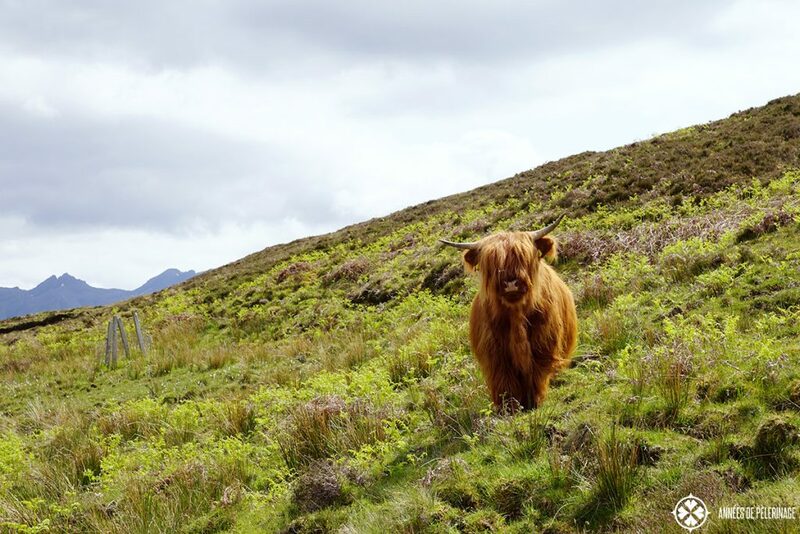 An abundance of wildlife can be seen on and around the Isle of Skye. White Tailed Sea Eagles, Golden Eagles, deer, otter, grey seals, dolphins, puffins, porpoise, whales – the list is as long as illustrious. The best way to get a chance to see it all is by boat. 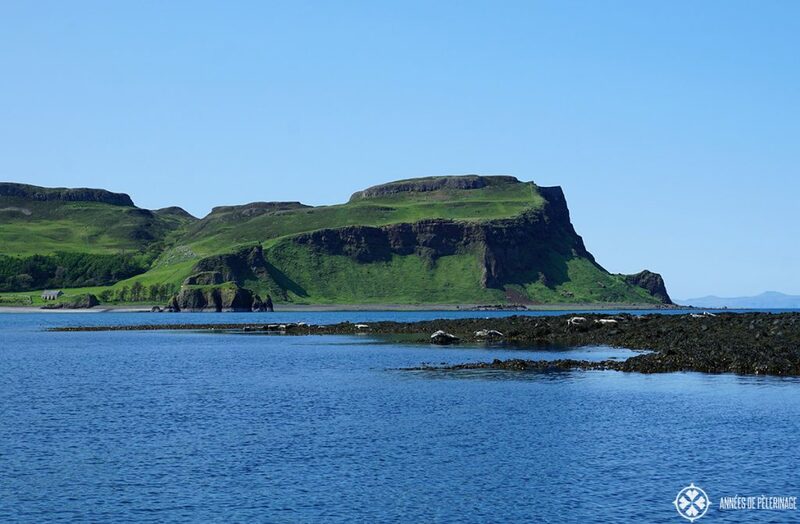 Personally, I decided to take a day trip to the Isle of Rum, always skirting along the coast and different lesser islands. While not exactly the cheapest option, the things you will see on your trip are more than worth the moderate expenses. I liked the isle of Sanday the most, though. It felt like the perfect place to write a book (if I ever, in a fit of madness, decide to write another one, that is). Nothing, so it seemed, would ever be able to disturb you here – save the passing of the seasons and the rolling of the tides. There was a small colony of seals very close by. Pity I forgot to bring my telephoto lens to take a better picture of them. Then again I had my binoculars and the experience itself counts the most, wouldn’t you say? There are also many spots to see Puffins around the Isle of Skye (though, sadly not on the island itself). The Cliffs around the Isle of Canna are a good spot. 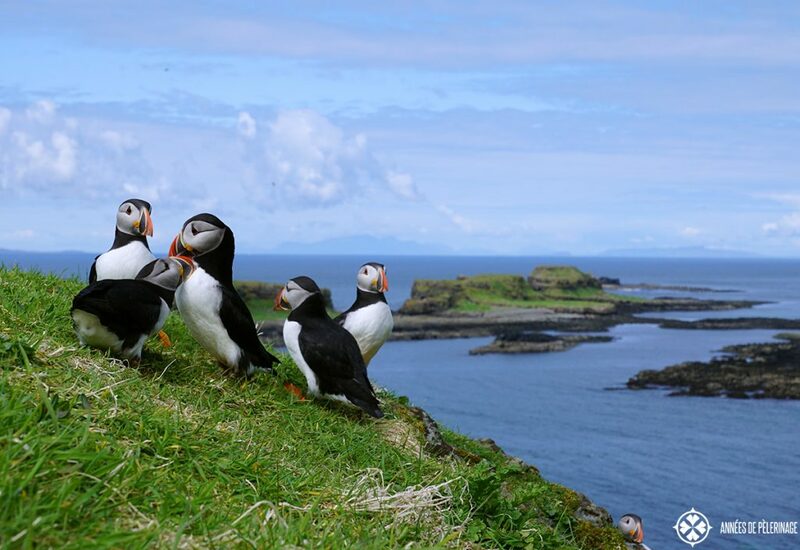 If you got the chance, do visit Lunga (read about my outstanding experience with more than 4,500 Puffins here) or St. Kilda, where they are more abundant, though. Contrary to what you might think, the Isle of Skye didn’t have had the luxury of peaceful history. Yet the MacLeod clan has had its seat here for more than 800 years. 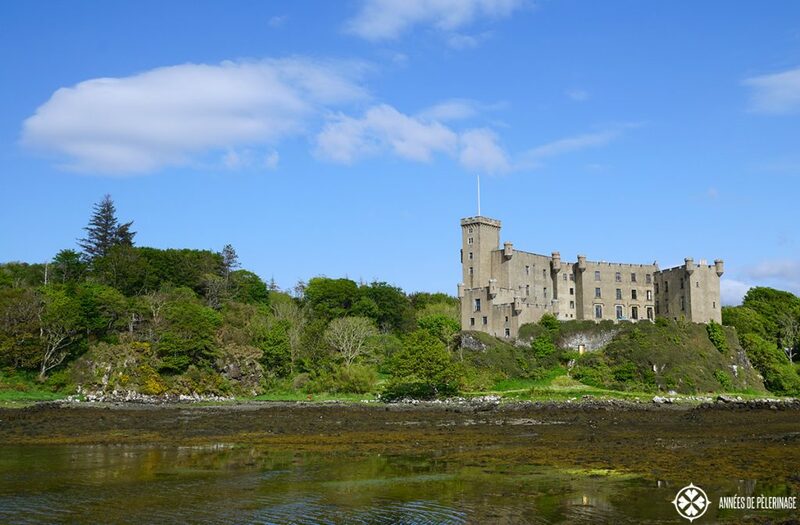 Dunvegan Castle is the oldest continuously inhabited castle in Scotland (technically speaking the current clan chief only has a small flat here these days). Still the castle and its gardens make for a nice half-day trip. It is possible to go inside and see how the clan chiefs used to live in the old days. There is also a grey seal colony close by. Tours actually leave right from the castle grounds. 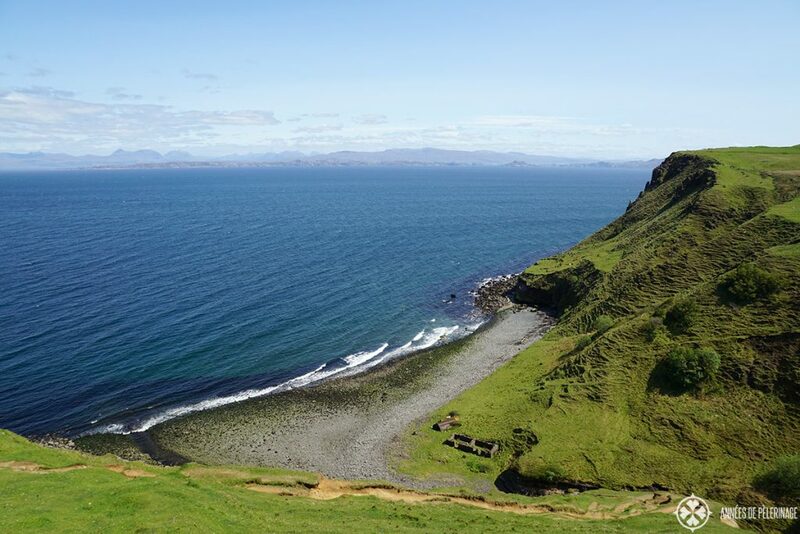 The Isle of Skye might as well be called Isle of Cliffs. Now mind you, I got nothing against high cliffs. They surely make for great pictures. But sometimes I got that urge to walk along the surf. 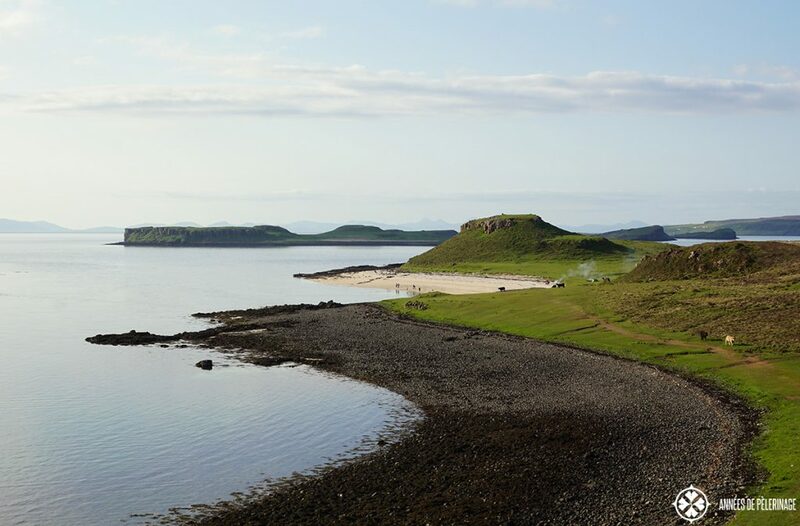 The Coral Beach near Dunvegan will be your best place to enjoy a wonderful picnic at the beach. Just how that short stretch of pristine white coral beach ended up here (especially being surrounded by large volcanic gravel), remains a mystery to me. But then again there is no need to explain it, for enjoying the warm breeze on the glittering sand is all that matters. 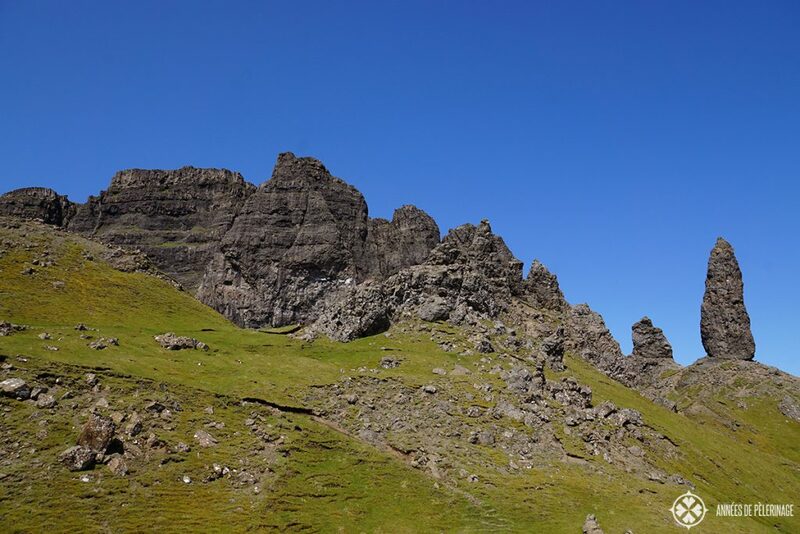 If you were looking for crowds, then choosing the Isle of Skye as your destination might have been the wrong idea. 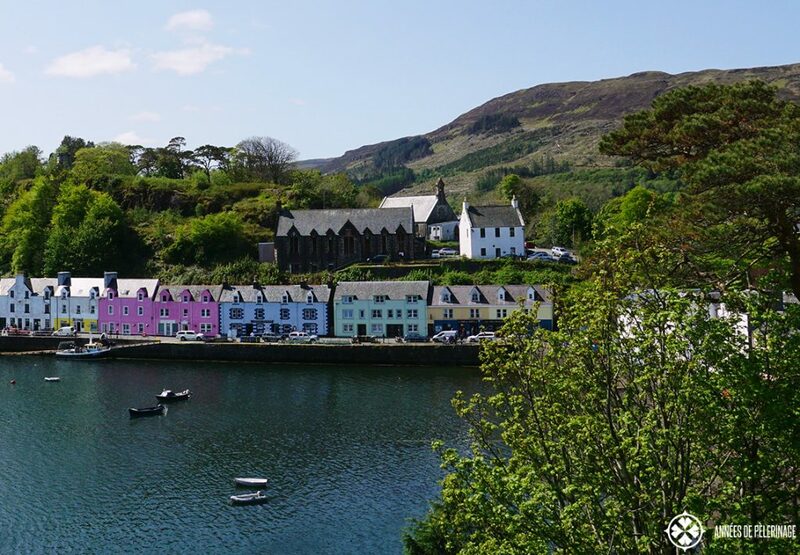 The closest thing resembling city life is probably the town of Portree, sometimes called the capital of the Isle of Skye. 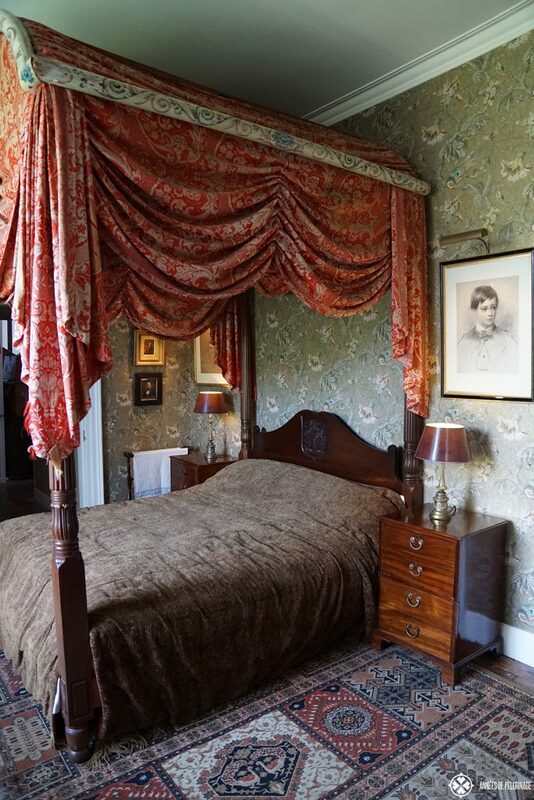 Most hotels and bed & breakfast can be found here. Being almost in the middle of the island, it is a very good place to start your explorations. There are a couple of pubs and lovely restaurants around the town square, as well as a large supermarket (in case you are opting for self-catering accommodations). I really enjoyed Portree. But don’t expect a lot. There are just a couple of shops, sometimes a market and once a year the local highland games. Now I promised you two bonus items on my list of things to do on the Isle of Skye and bonuses you shall get. 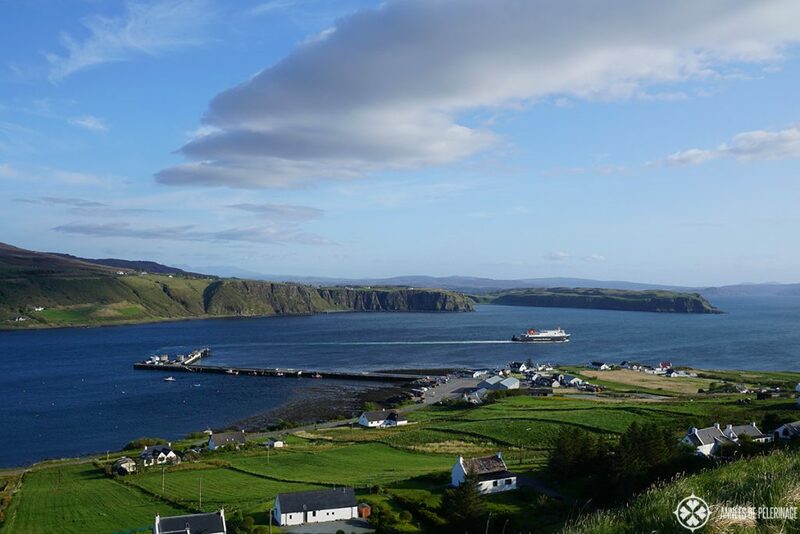 The only way to reach the Isle of Skye is by car or ship (there are regular ferries). I recommend you to take the car and enter via the bridge (even if your navi tells you to take the ferry). Why? 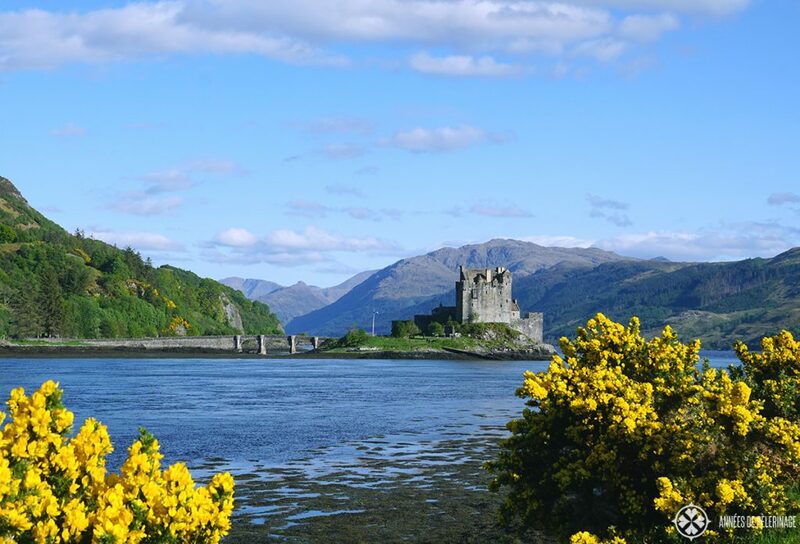 The reason is called Eilean Donan Castle and there really is nothing else I need to say. Surrounded by water on all sides, it is arguably the most beautiful castle in Scotland. Early mornings are better for taking pictures since the sun will stand directly behind the castle later in the evening. 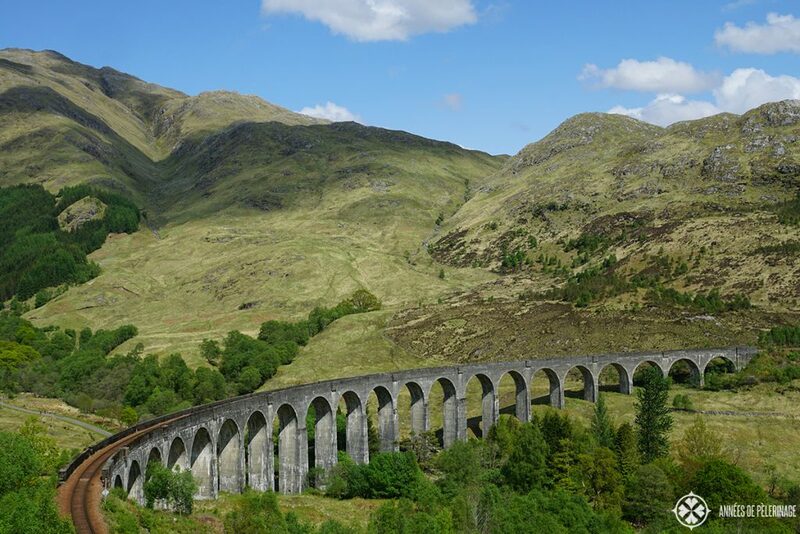 Another reason to take the car to the Isle of Skye is the Glenfinnan viaduct. Close to Fort Williams you will more or less pass this amazing engineering highlight. Looks familiar? Well, then you probably saw Harry Potter riding the train to Hogwarts. Two hints for visiting the Glenfinnan viaduct. 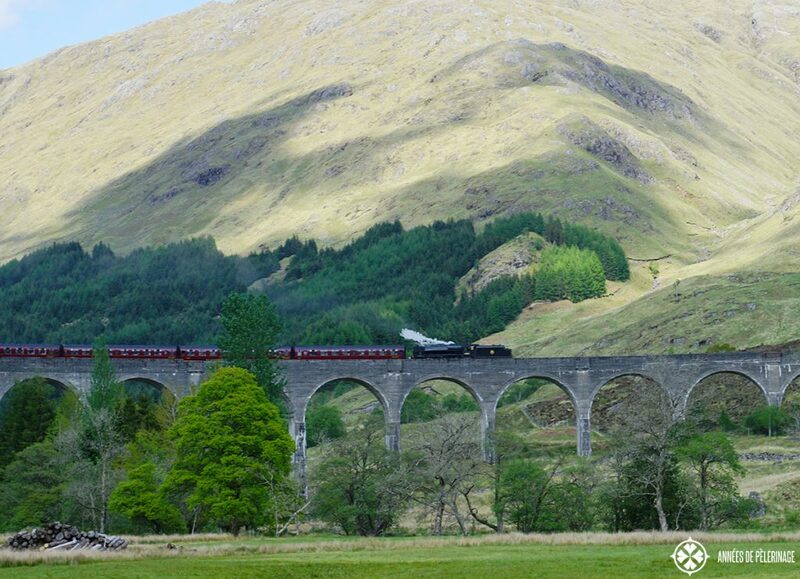 First of all, do check the train schedule to see the Jacobite steam train passing over the viaduct. Secondly – do not, I repeat, do not take the viewing platform directly next to the parking lot. The view from there is..not especially noteworthy. Walk over the bridge and follow the winding path upwards (20min walk) to see the classic view! So that’s it. That has been my list of things to do on the Isle of Skye. I am quite positive there are much more highlights (in fact I’ve seen quite a lot more). I just felt like reducing the list a bit to things you really must see. If you got plenty of time at hand, do plan a trip to the Outer Hebrides (or even St. Kilda) or any of the other wonderful islands in the immediate vicinity of Skye. Hiking certainly is always an option. For luxury definitely, check out the Three Chimneys restaurant – one of the best in Scotland. But also consider buying a guidebook. The Internet is not exactly abundant on the Isle of Skye and it will always be helpful to have a guidebook along. If you are wondering when to visit the Isle of Skye, you should definitely consult a climate diagram. May through August is fairly dry and warm, though you should never expect a Caribbean summer. In fact, I feel some pangs of remorse after having shown you all these sunny pictures. The general weather is a lot wetter. I just happened to be beyond lucky during my stay (compare that to my visit in Ireland; on the Aran Islands it rained so heavy that I appear to have wetted my pants on half of the pictures). Then again, who says you won’t be lucky, eh? Wow! Norman, thank you for these great tips. Your pictures are soo amazing. Makes me wanna book a trip (if only I had the money that is). That Neist Point lighthouse looks like not from this planet! I’m currently planning a trip over to Scotland next year, this article has definitely helped me to decide where to go. Interested to know if you tried free-camping around the area? Great list! We camped across Scotland last July (including on Skye) and enjoyed ourselves so much that we are looking forward to doing again this summer. For camping, I’d recommend the incredible Scotland Overland, where you can rent a rigged-out Land Rover Defender and camp on the roof, avoiding the wet ground. We did all of your recommendations except one – Neist Point but we got to see the two bonus recommendations. My favourite was the Quiraing. Stand tall in the wind was a task unto its own. Got to see deer and a coo but no marine life. I would do it all over again if we could! Thank you for bring back such great memories. that is great & thank you for your kind words! 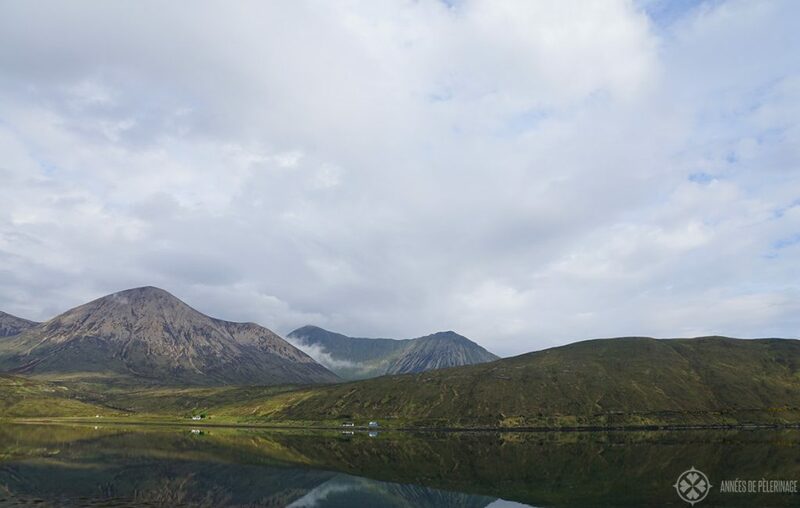 I do plan to return to the Isle of Skye myself…it’s such a magical place! It is a magical place! I was there in 1989 and have longed to return, but just not had the opportunity to go back. Being young, innocent, naïve, and brave I struggled through quick sand to lay on a towel on a flat beach area. Later, finding it to be a short runway for landing small planes (as one circled overhead), I was quick to return to the B’nB where the owner laughed at my story, expressing the need to ask a “local” for information before jumping fences and approaching forbidden areas. I saw the places you recommend and heartily agree! Your photos and descriptions are wonderful! 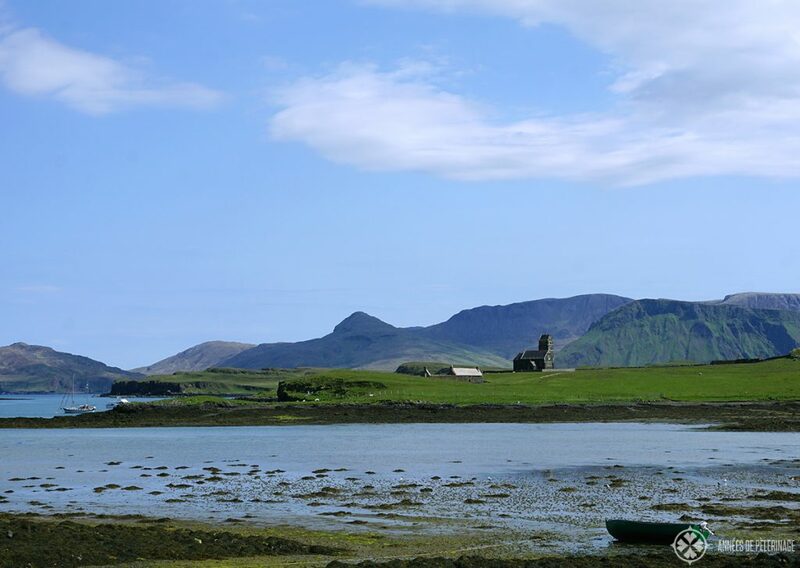 I had many adventures on the Isle of Skye….Thank you for the trip down memory lane! sounds like a magical journey u had back at the end of the 80ies as well! :) Glad I was able to bring back memories. This is so extraordinarily helpful! I am visiting the Isle for just one day before I head inland to Kintail and Glen Shiel, this August. Are there any good boat tours / things like that to see wildlife from Kyle of Lochalsh or someplace close—I’m traveling alone and so looking to be back by sunset each day. Ideally, I would stop at the Eilean Donan one morning and then go on to something like that. Thank you! Not very sure about boat tours from Kyle of Lochalsh. Haven’t stayed there yet, sorry. To view the places you recommend how long should you plan to stay on there? I have been there but only saw a tenth of what you highlighted. Thank you. Great article. Thanks for the review! Can’t wait to go next year! Is it possible to do the things you recommended without a car? well strictly speaking: no. You really can’t tour the Isle of Skye without a car. But there are tour companies offering round trips. So you might want to check that out. 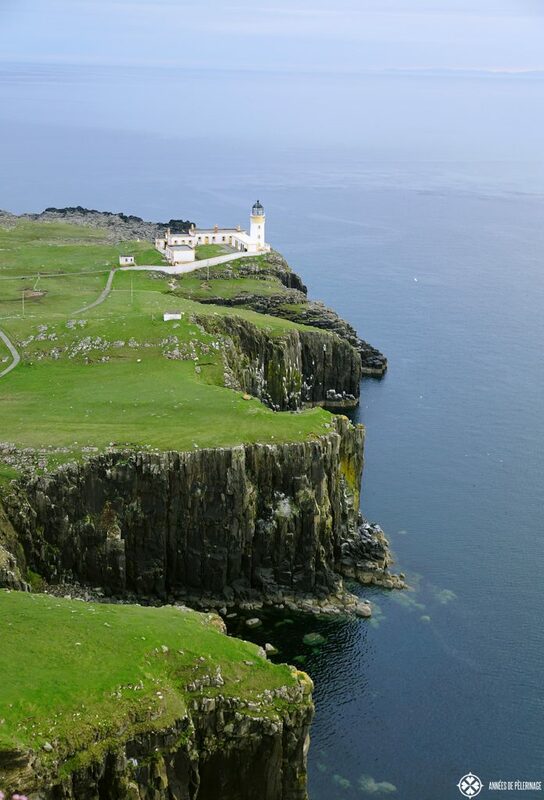 Might i suggest, anybody visiting Neist point, pack a travel spinning fishing rod and a few lures. The pollack fishing can be non stop, but please only take what you need. Mackerel are there all summer too, great on the evening barbie. I’m not sure why you would expect yurts on the isle of skye? There are some camping grounds, though. Excellent post! Are you able to share the name of the wildlife boat trip you mention please? Looks like there are several options in the area, but the one you mention sounds amazing. Thank you again for sharing this post! All the best! You didn’t mention the excellent restaurants by the harbor in Portree. While waiting for a table we watched fishing boats come in with Langoustines heading for Spain. They looked,amazing. Also worth a mention is Flora McDonald’s grave. She helped save Bonnie Prince Charlie. If driving from Glasgow you will see the most amazing scenery ever to behold.